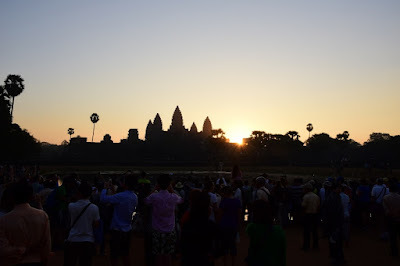 Andre's Fortress: Harry Potter and the Chairs of "Chiam"
On 29 December 2015, in Siem Reap, Cambodia, we woke up at approximately 4am to catch the Angkor Wat sunrise. We left by tuk-tuk at about 4.30am, not having eaten breakfast but the hotel had provided us with freshly baked hot bread to eat on the tuk-tuk. 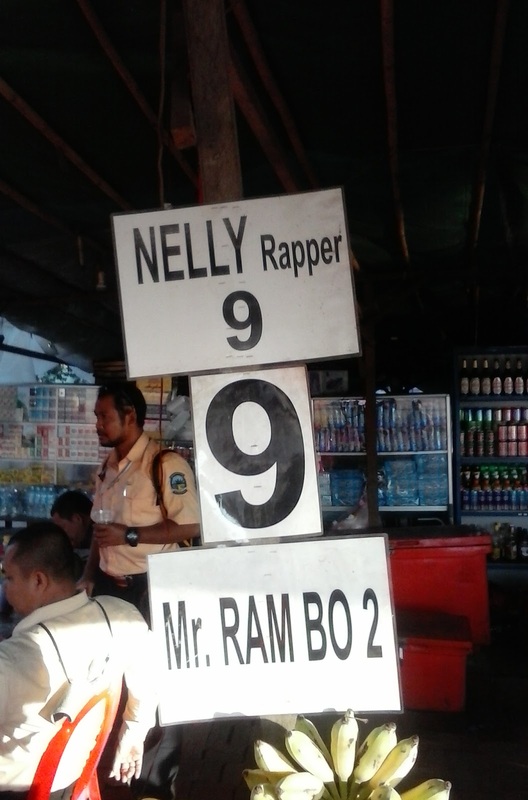 Even before we arrived at the ticketing booth, it was clear that we were not the only ones who had the same idea. 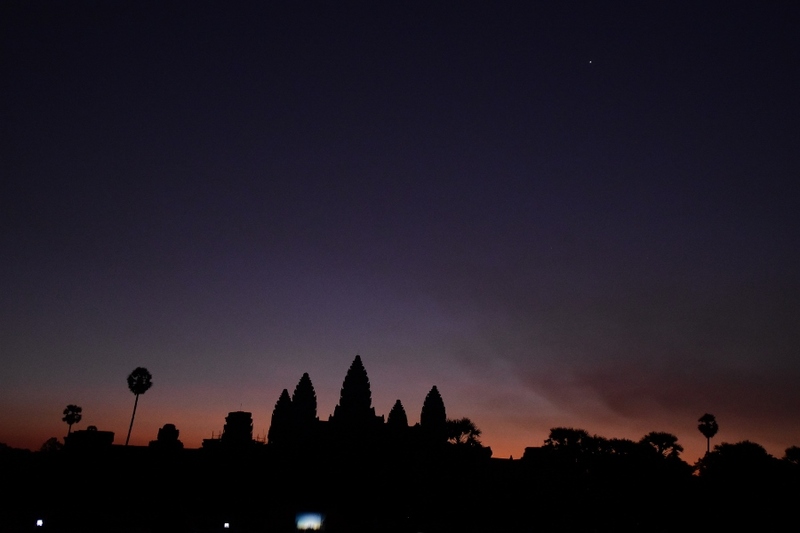 Streams of tuk-tuks and cars could be seen and heard in the darkness, scurrying towards Angkor Wat. After obtaining our tickets, and after a further short ride, we then proceeded to the dark stone steps of the bridge that lead to the temple. The hoard of tourists, which was becoming larger as time went on, got into position around the lake in front of Angkor Wat. The sunrise itself, in my view, was good but overrated. The sun did not actually come out until around 6.40am. However, there was a related incident that will stick in my memory for the rest of my life and rates a mention. "I (sic) show you a place to take photos. You stand over there (*he pointed*) and you can take photos like this (*he pulled out his smart phone and showed examples of shots he had presumably taken himself*). During this time of the year it is best to stand over there where you can capture all 5 'towers' of Angkor Wat." "My name is Harry Potter. Please come to my store for breakfast after sunrise. 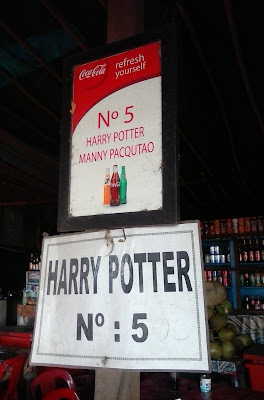 Remember, Harry Potter shop number 5." 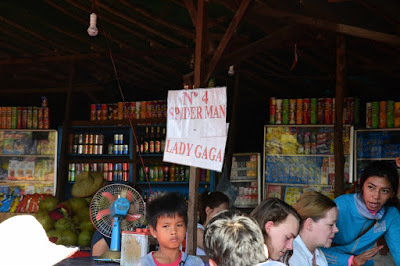 I had a shock - Harry Potter in Cambodia! - what kind of tourist trap was this? We said OK, and thanked him again. "Would you like a place to sit? It is free, I can give you some chairs." We nodded, thanking him for his kindness. The taller Cambodian left momentarily and brought back some chairs. "Please remember to come to my store for breakfast after sunrise. 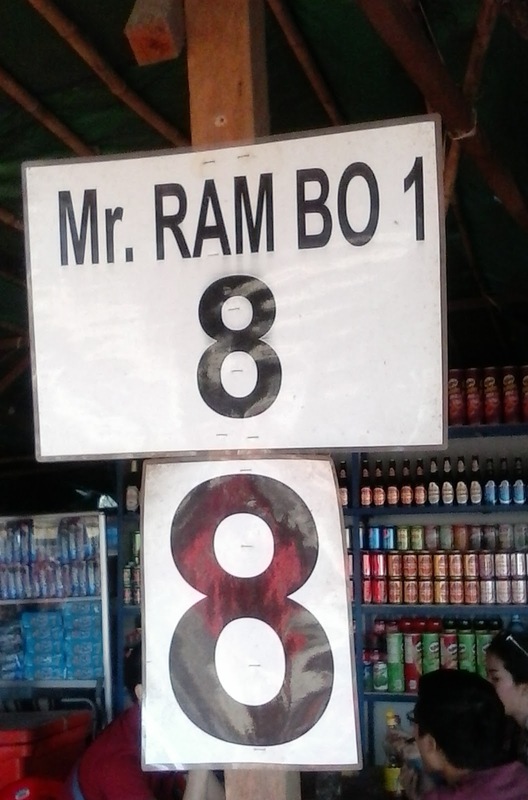 My name is 'Chiam' -- shop number 10". "Hey what about me?! You remember me right? I am Harry Potter shop number 5. You know that Chiam is different to me right? I thought you were going to visit me at sunrise." I felt the moral conundrum. "We will buy something from both of your shops, don't worry." Harry Potter seemed content with this answer. After sunrise my sister and I went to Harry Potter's store and my dad and mum went to Chiam's store. Interestingly the other vendors had other interesting aliases such as "Mr Rambo 1", "Mr Rambo 2" or "Lady Gaga". We thought that this 2-2 split was the only way to be fair; however, in the end, sadly, Harry Potter lost out to Chiam as my sister and I were not that hungry and, therefore, only ordered US $3 worth of goods (Yeo's Grass Jelly and a hot chocolate). Clearly we had not thought this through properly. "So what would you like to order for breakfast?" "I'm really sorry, we're not that hungry but thank you very much." There was a sad look in Harry Potter's eyes. This was understandable. After all, this was his livelihood. I looked over to Chiam's store, and it was bustling with customers (customers who had all, presumably, earlier accepted Chiam's offer). In stark contrast, Harry Potter's store was relatively empty. It was clear that Chiam's "chair ploy" had paid off. For that short moment in time, I - at least, partially - regretted eating the freshly baked bread that had been given to us by the hotel.